The Knit With's founder, Marge Casale, was an expert knitter and accomplished needle artist who grew up on a sheep farm along a remote stretch of the foggy, wind-swept, yet idyllic, North Atlantic coast. She was introduced to knitting, at the age of 8, by her grandmother -- whom she credited for giving her a strong foundation in knitting and the spiritual encouragement to attempt, and accomplish, any task. After settling in Chestnut Hill, Marge was taught one of the four basic crochet stitches by a disabled Philadelphia fireman. Marge's needlework knowledge was primarily self-acquired and extended to all needlearts: embroidery, needlepoint, tatting, weaving and sewing. During her lifetime, she was recognized as an accomplished expert in the lore and techniques of knitting and as an exceptional knitwear designer. Marge's designs were inspired by the cycle of the seasons and the infinite variety of stitches available through knit and purl -- so similar to the ever-present ebb and flow of the tides surrounding her family home on a Point jutting into Conception Bay. Marge's knitting designs, published in major national knitting and needlework magazines, included almost every conceivable garment to which knitting and crochet could be applied. At the close of her days, she was completing books on both knitting techniques and her favorite patterns. Exceeding her passion for knitting design, Marge enjoyed welcoming others to the joys of knitting and crochet. Her teaching philosophy was to gladly share the skills necessary for others to become liberated and independent knitters who would proudly wear their handknitted garments. 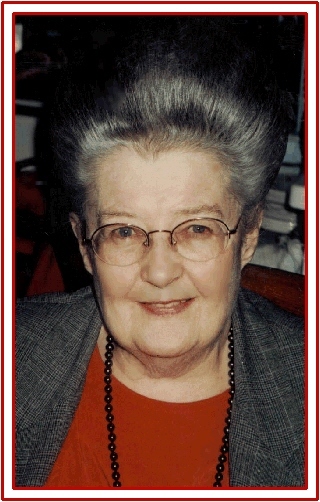 As an experienced adult educator, Marge established several needlework courses in area adult education programs and wrote a complete course of study in knitting for courses offered at the former Philadelphia College of Textiles and Science, now known as Philadelphia University. Marge's knitting students, numbering in the thousands, proudly wear the diplomas from her classes! In 1970, Marge established The Knit With as a natural fibre and fashion-focused yarn shop with a special emphasis on providing handknitters yarns with unique colorways, textures and twists -- at a time when better yarn shops provided only smooth finish, solid color, synthetic yarns primarily pre-packaged in cellophane and oftentimes available only behind the sales counter. She was at the forefront in modern yarn store merchandising: dispensing with cellophane packages, openly displaying yarns so customers could experience the color and texture of the yarn before purchase, combining different yarns to create unique designer effects, holding planned classes to introduce knitting to non-knitters, and concentrating on high quality, natural fibre, novelty and hand dyed yarns from imported as well as domestic sources. In 1999, Marge formalized her long-time partnership in The Knit With with her son, Jim who has served as the Managing Director of The Knit With since 1985. Prior to founding The Knit With , Marge enjoyed an active and rewarding career in insurance and real estate sales. She was the first female sales agent with the Philadelphia agency for the Prudential Insurance Company and for many years conducted real estate sales in the greater Northwest Philadelphia area when the real-estate profession generally excluded women or relegated women to clerical roles. In addition to her business acumen, Marge was a dedicated gardener who delighted in raising roses, collecting species for their fragrance, color or form. Her gardening focused on unusual flora and she would often maintain various forms of a plant such as over 30 variations of daffodils and 4 distinct varieties of lily of the valley. Her garden contained many unusual species of flowering flora, all notable for their aromatic fragrances and all carefully collected and cultivated by Marge during her lifetime. From the first blush of Spring blossoms, through the Autumn's final frost, Marge's garden was, and remains, a dazzling, daily display of floral color and texture present somewhere on the grounds. She also maintained her own herb and vegetable gardens. She was an accomplished cook whose skills ranged from country simplicities to elegant gourmet dinners with soups and sauces being distinct specialties. She was an avid antiquarian, specializing in cut glass from the American Brilliant period, and engaged for almost 30 years in the restoration and renovation of her historic home, The Detweiler House , the upstairs of which served as her home. Marge was the mother of eight and known as Nana to her grandchildren. In July, 2004, Marge's zeal for and zest in life came to its zenith. Marge's legacy in knitting, gardening, and antiqueing is carried on by her son Jim and daughter Dawn, experienced knitters both and taught by one of the best!